New York State Park rules and the Amherst Town Ordinance require all dogs within the park to be leashed at all times. Park visitors are asked to please clean up after their dogs. Summary: These New York statutes comprise the state's dog laws. Agriculture and Markets Law. Chapter 69 Of the Consolidated Laws. Article 7. Licensing, Identification and Control of Dogs. a. Allow it to hunt deer, or to run at large on enclosed lands on which wildlife or domestic game is possessed under license issued pursuant to the Fish and Wildlife Law or in any state park, state park reservation, state-owned game farm or wildlife refuge or state-owned or leased wildlife management area. 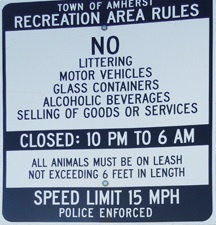 This chapter is to promote the health, safety and general welfare of the people of the Town of Amherst, New York, including the protection of the property of the town and its inhabitants, to preserve peace and good order by imposing restrictions upon the keeping and running of dogs within the town and to set license fees in addition to those provided for under Subdivision 1 of § 110 of the New York Agriculture and Markets Law. A. No person, firm or corporation owning, keeping, harboring or having the care, custody or control of any dog shall allow or permit such dog to be off the premises of such person, firm or corporation in the Town of Amherst, New York, outside the Village of Williamsville, unless restrained by a chain or leash not exceeding six feet in length and under the control of a responsible person. Whenever a dog is found off the premises of the person, firm or corporation owning, keeping, harboring or having the care, custody or control of such dog not restrained as above provided, it shall be presumed that such person, firm or corporation permitted or allowed such dog to be off such premises in violation of this section. (a) Feces shall be placed directly in a public or private sanitary sewer through deposit in a toilet on premises occupied by the person owning or who curbs the dog. (b) In no event shall any feces be deposited in any storm sewer or drainage ditch. (2) Exclusion. The provisions of this section shall not apply to a guide dog accompanying any blind person.